Put the flour, sugar and cardamom in to a small mixing bowl. You can substitute some of the flour with semolina if you want such that, for example, you might instead use: 120g self-raising flour and 100g semolina. Substituting 80g of flour with 100g of semolina. 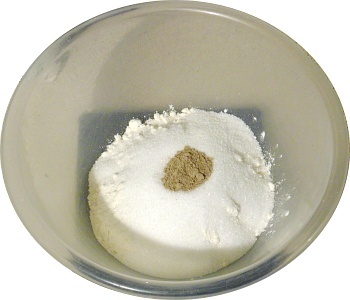 The more semolina you have, the less they will spread out during baking. The cardamom can either come from ready-powdered cardamom or from seeds that you have separated from their pods and then ground yourself in a mortar and pestle. The latter will have a coarser texture which, if anything, is probably better - the little pieces of cardamom forming subtle, taste explosions in the mouth. 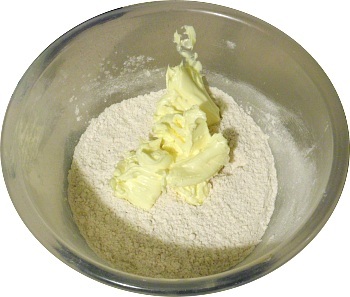 Add the gheo and then mix it in well, first of all with a fork and then tip it out and knead it on the work surface. This dough does not have enough water in it to allow you to roll it without it falling apart so you have to keep on pressing, folding and turning. Note that the more water you add, the easier it is to process it when rolling it out. However, the more water that is in it, the more they will spread when you bake them. One thing to consider when adding water is the amount of water that is aready there - for 100g of margarine, you have 20g of water that is not in the gheo. 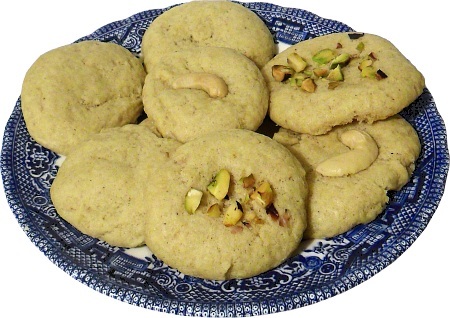 make the naan khatai biscuits from. Roll it out/extrude it - it is not ductile at all - to make a long cylinder around 3cm in diameter. Divide it into four and then each of those into five, giving you a total of 20 pieces to make a four-by-five array on the baking tray. Alternatively, you can divide it into two, then those into three and then each of those into three again, giving you 18 so that you can make alternate rows of four and five, giving them more space on the baking tray. Or, if you want smaller ones, divide into four and then each into seven, giving you 28 so that you have fows of six, five, six, five and six. and put whatever you want on them. Line a baking tray with non-stick baking paper - the silicone rubber mat is ideal for this as an alternative. 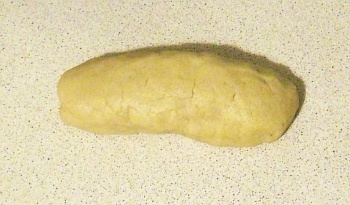 Roll each of the portions of biscuit dough into a ball. 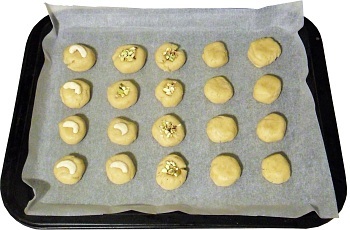 Put them onto the baking paper and flatten them slightly by pressing them with your finger tips. 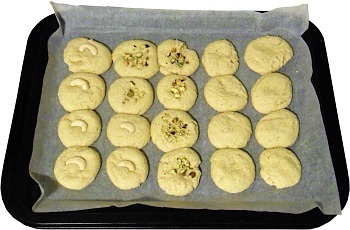 When you have laid them all out, you can put whatever topping you like on them - here, I have plain ones, cashew nut halves and chopped pistachio nuts. try not to eat too many at this stage. Pre-heat the oven to Gas Mark five (191C) and bake them in the middle of the oven for around 25 minutes, or until they start to turn a vary pale brown - they are not supposed to be particularly dark. Let them cool down on a cooling rack and separate them. 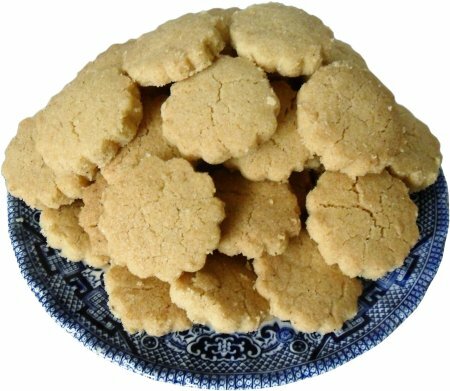 Margarine and just self-raising, wheat flour. flour and 100g of semolina (all other ingredients the same). out with a 2.5cm pastry cutter, producing around 50 biscuits. add some cocoa powder and some chocolate drops and dip them (either halfway or completely) in melted chocolate. 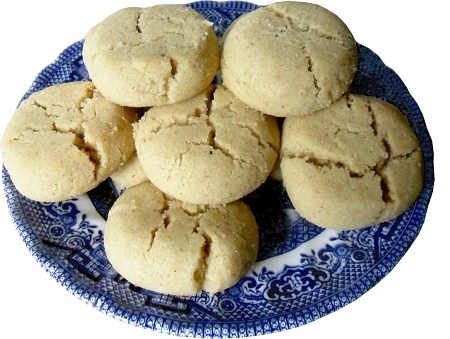 Note that in the USA, biscuits are sometimes called 'cookies'.